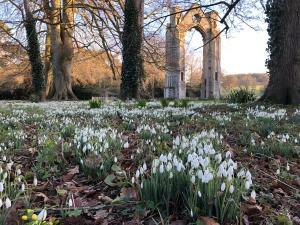 Snowdrops surround the Abbey ruins from late January to early March, the first signs of spring. A place of pilgrimage since the 11th century, visitors can enjoy the tranquil gardens and, over the ancient packhorse bridge, the river and woodland walks lead into unspoilt woods and parkland famous for spectacular snowdrops in early spring. Walsingham Abbey Grounds and ruins are open throughout the year. When the Shirehall Museum is closed, entry is on weekdays only, and the entrance is at The Estate Office, adjacent to the Museum. Admission to Walsingham Abbey Grounds includes the Shirehall Museum when it is open. Adult £5.50, child 6-16 £2.50. Under 6 free.